Fracture of mandible is relatively less common in pediatric population when compared to adults. Management of pediatric mandibular fracture is a very complex issue and requires accurate and early treatment. Although the general principles of treatment remain the same as adult but various factors which influence the choice of management: age, dentition status, site involved, amount of displacement, number of fractures, and socioeconomic status. 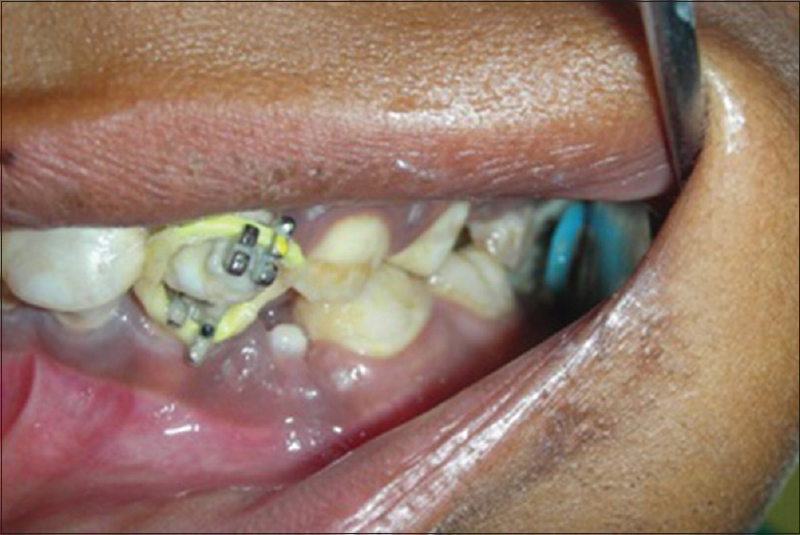 This case report describes a conservative way of management of moderately displaced mandibular fracture with the help of closed reduction achieved using intermaxillary fixation (IMF) with help of elastics using orthodontic brackets. 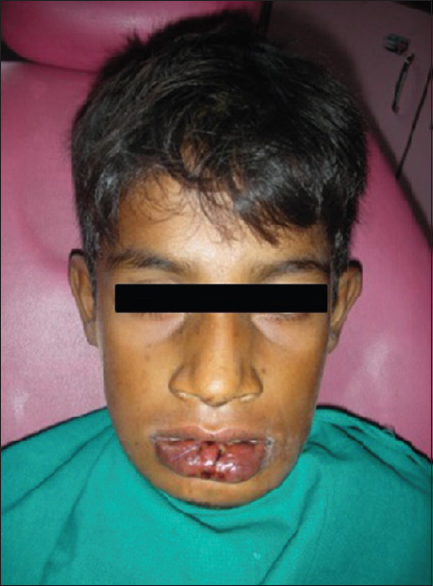 A 9-year-old male child was treated for body of mandible fracture using this technique. The IMF was removed after 3 weeks and adequate bone union was demonstrated clinically and radiographically. Trauma to maxillofacial region in pediatric population affects the physical and mental well-being along with deterioration of function, esthetic appearance, growth and development. The overall prevalence of pediatric facial fractures is much less than adult population. The most commonly involved bone in pediatric facial fracture is mandible, in more than 50% of the cases. The most common sites in mandible which are involved are: condyle followed by angle, symphysis, and body., Fall is the major cause of mandibular fracture in pediatric population. Basic treatment protocol for mandibular fracture is anatomical reduction and stabilization till bony union takes place The clinical manifestations of mandibular fractures are similar for both adult and pediatric patient but treatment protocols are different. Various options are available which includes: conservative management for undisplaced fractures through soft diet, intermaxillary fixation (IMF) with the help of eyelet wiring and arch bars, circummandibular wiring with help of various types of splints, use of stents. Alternative treatment includes: Open reduction and internal fixation (ORIF) either intraorally or extraorally with the help of plates and screws (bioresorbable plates and screws are preferred). The factors which complicate the treatment of mandible in pediatric patients are: presence of tooth buds of permanent teeth, jaws in growth phase, anatomy of deciduous teeth not ideal for various types of wiring technique to achieve IMF and compliance of patient. Due to these reasons, the ideal treatment of mandibular fracture of ORIF is not recommended. ORIF is associated with negative effect on skeletal development and teeth. Therefore, a conservative approach for management of mandibular fractures in pediatric patients is recommended. 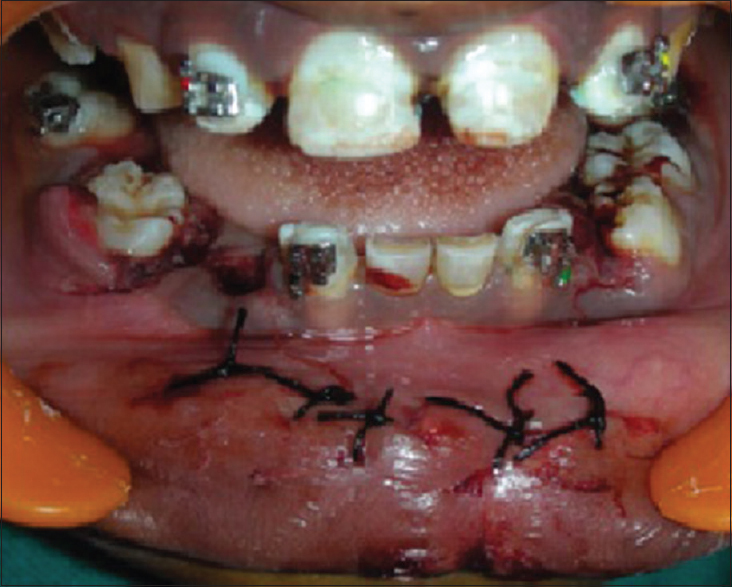 In this case report, an alternative method of IMF was used for conservative management of body fracture of mandible in a 9-year-old child with the help of orthodontic brackets and elastics. A 9-year-old male child patient reported to us with complaint of trauma to the lower jaw after fall from a tree 3 days before. The child had no history of loss of consciousness, convulsions, or vomiting. There was neither nasal nor ear bleeding. The child was well oriented, cooperative, and little anxious. There was no significant medical or dental history. On clinical examination, there was swelling over the anterior lower third of the face with sutured laceration over the lower lip. Mouth opening and TMJ movements were normal [Figure 1]. On palpation, there was tenderness and step deformity on the left body region of mandible. On intraoral examination, there was edema and sutured laceration over the lower lip with slight pus discharge. The buccal sulcus in respect to 74, 75, 36 was obliterated with ecchymosis [Figure 2]. On palpation, there was severe tenderness over the 74, 75, 36 region with step deformity. Occlusion was deranged with open bite on the left posterior region. Orthopantomogram (OPG) was done. OPG revealed a radiolucent line between 74 and 36 extending from alveolar process to the lower border of mandible with slight displacement of the fractured segments [Figure 3]. Based on OPG findings, conservative approach was chosen for management with closed reduction. The child was in mixed dentition stage with multi carious teeth therefore use of arch bar wiring or eyelet wiring was not feasible. Hence, we decided to use orthodontic brackets along with elastics for stabilization of fracture segments with help of IMF. The infected lacerated wound was debrided and re-sutured after injecting local anesthetic agent. Left inferior alveolar nerve block was given to make the child more comfortable to place the IMF. Only the permanent erupted teeth were considered for the placement of orthodontic brackets to avoid subluxation of the deciduous teeth. Orthodontic brackets were placed anteriorly and posteriorly on both the jaws to achieve a good IMF [Figure 4]. The teeth which were chosen were 12, 16, 22, 26, 32, 36, 42, and 46 (permanent 31, 41 were congenitally missing). MBT stainless steel brackets with hooks were placed and bonded with standard technique over these teeth. After placement of brackets the fracture segments were manually reduced and brought into occlusion. IMF was done with the help of tight elastics placed from upper jaw bracket hook to lower jaw bracket hook [Figure 5]. Oral antibiotics and painkillers were prescribed along with mouth wash. The child was discharged with following instructions: To avoid mouth opening, to be on liquid diet, to keep his mouth clean, and to avoid any type of fermentation to the maxillofacial region. The child was recalled after 1 week for evaluation and suture removal. During 1 week follow-up, the extraoral swelling had totally subsided and the laceration over the lower lip had adequately healed and suture removal was done. All the brackets were intact with good IMF with elastics. The occlusion was intact. The overall oral hygiene was good. The elastics were changed to maintain adequate IMF traction. The patient was again recalled after 2 weeks for reassessment of the healing of the fracture of mandible. On clinical examination, there was no mobility of the previous fractured segments and tenderness was also absent. There was no step deformity palpable. IMF elastics were released and debonding of the orthodontic bracket was done. During this period also, the oral hygiene was well maintained [Figure 6]. Postoperative OPG revealed complete healing of the fracture site with mild cortical overgrowth [Figure 7]. As the patient had multiple carious teeth and root stumps, he was called for dental treatment after 3 days. Mandible is most commonly involved bone in maxillofacial trauma in pediatric patients. Although the pattern and clinical features are similar but treatment modalities are different when compared to adult mandibular fracture. The pediatric fracture has advantage of better healing capacity, remodeling potential, high recovery rate of tissues, and better vascularization. Disadvantages include: presence of developing tooth buds, transitional dentition, and developing skeletal structures. Therefore, the treatment protocol for pediatric fracture should utilize the advantages and minimize the disadvantages. These factors have led to a conservative approach for the treatment of mandibular fracture in pediatric population. Various treatment options are present which can be utilized according to the age, dentition status, pattern of injury, and site of fracture. For green stick fracture, no intervention is needed except for child is put on soft or liquid diet along with prescription of antibiotics and analgesics, closed reduction with the help of interdental wiring. For moderately displaced fractures: open or closed cap splints along with circummandibular wiring. IMF utilizing arch bars and eyelets can be used. Disadvantages of these techniques include: construction of splints require laboratory procedures, IMF techniques are not ideal for pediatric population because of the anatomy of primary teeth and transitional stage of dentition, problems of maintenance of oral hygiene, patients compliance, and psychological effect of IMF in early age. For severely displaced fractures or multiple fractures ORIF is recommended. This can be accomplished with the help of titanium or resorbable plates. It gives adequate reduction and immobilization but associated with a number of complications. ORIF with titanium is a two-stage procedure because these plates are to be removed as they can cause restriction in growth if left in situ. Furthermore, the hardware may act as nidus for infection. The placement of screws may cause injury to the permanent tooth buds. Uses of resorbable plates though obviate the need for second surgery and resorb within a specific time frame but they are also not free of complications. The use of monocortical screws is not free of risk of injury to the permanent tooth buds also they have been associated with foreign body reactions. In addition, the use of resorbable plates is technique sensitive and requires complex procedure and is not cost-effective. Both methods for ORIF require periosteal stripping and may disturb the functional matrix and can cause developmental disturbances . In this case report, based on clinical examination left body fracture of mandible was suspected and was confirmed using OPG. The fracture was moderately displaced with movement between the fracture segments. The option of closed reduction with help of arch bar wiring or eyelets was discarded due to the fact that multiple carious teeth were present along with exfoliating primary teeth and few permanent teeth. The option of circummandibular wiring with help of open splint under general anesthesia was proposed but patient refused. Hence, finally, we decided to manage this case with closed reduction with the help of orthodontic brackets and elastic traction. The procedure was easily performed under local anesthesia and patient was fully cooperative during the procedure. The total time taken for the procedure was 30 min. 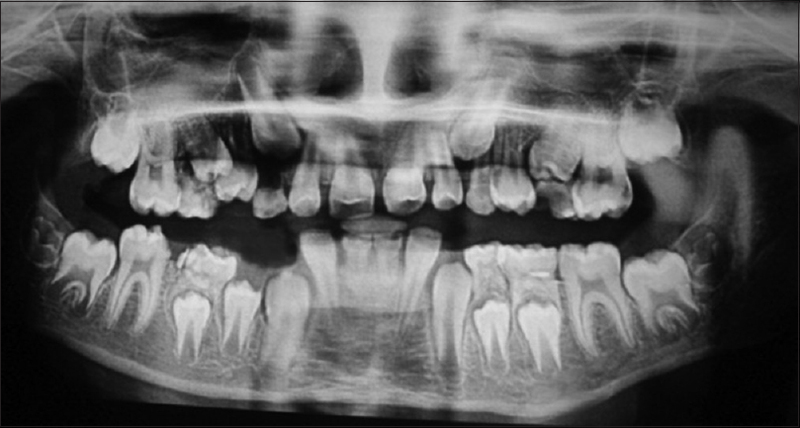 The plus points of this technique was that adequate traction was maintained during IMF leading to complete immobilization and stabilization of the fracture  segments for adequate bone healing, it was easy for the patient to maintain oral hygiene, as the technique was performed involving only the facial surfaces of the permanent teeth. No special instrumentation was required and technique was cost-effective. The disadvantages observed for this procedure was the need for repeated change of the elastics for maintenance of uniform traction. There is little technicality for the procedure, as wrong direction traction will lead to subluxation of tooth. This procedure is recommended in pediatric age group 8 years and above. This procedure has little applicability in cases of the comminuted or severely displaced fractures and fractures in edentulous region especially angle region. IMF using orthodontic brackets and elastics can be effectively used in treatment of moderately displaced mandibular fracture in dentulous region. The technique should be used with caution and selection of patient and type of fracture is important for the success of the technique. Carroll MJ, Hill CM, Mason DA. Facial fractures in children. Br Dent J 1987;163:23-6. Ferreira PC, Amarante JM, Silva AC, Pereira JM, Cardoso MA, Rodrigues JM. Etiology and patterns of pediatric mandibular fractures in Portugal: A retrospective study of 10 years. J Craniofac Surg 2004;15:384-91. Rowe NL. Fractures of the facial skeleton in children. J Oral Surg 1968;26:505-15. Anderson PJ, David DJ. 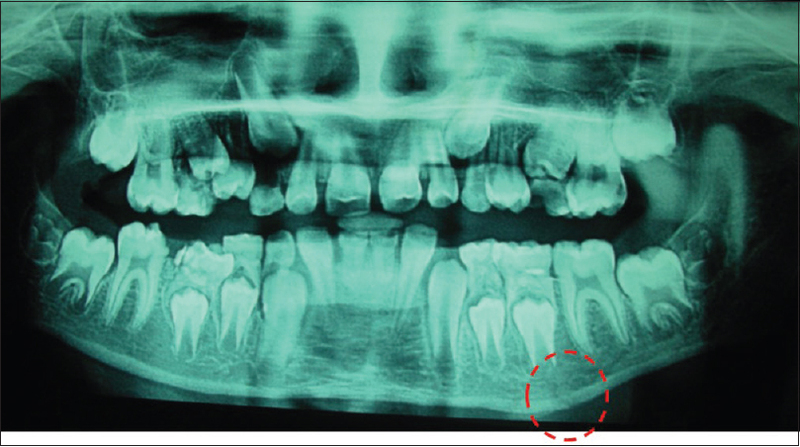 Hyperostosis as a late sequel of parasymphyseal mandibular fractures in 2 children. J Craniomaxillofac Surg 2005;33:188-90. Gawelin PJ, Thor AL. Conservative treatment of paediatric mandibular fracture by the use of orthodontic appliance and rubber elastics: Report of a case. Dent Traumatol 2005;21:57-9. Priya Vellore K, Gadipelly S, Dutta B, Reddy VB, Ram S, Parsa A. Circummandibular wiring of symphysis fracture in a five-year-old child. Case Rep Dent 2013;2013:930789. Aizenbud D, Emodi O, Rachmiel A. Nonsurgical orthodontic splinting of mandibular fracture in a young child: 10-year follow-up. J Oral Maxillofac Surg 2008;66:575-7. Demet K. Use of acrylic occlusal splint and direct bonded brackets for intermaxillary fixation in the treatment of unilateral parasymphyseal and condylar fractures: A case report. Clin Dent Res 2013;37:46-50.